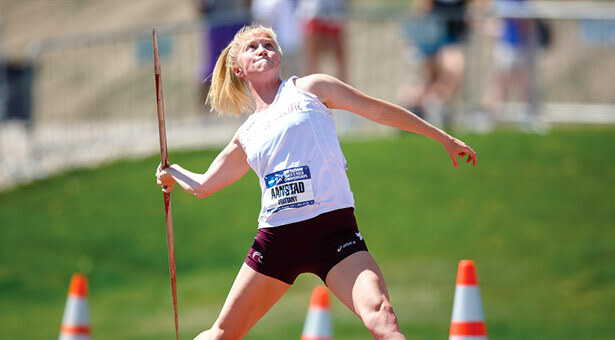 Brittany Aanstad's 2012 NCAA title in the javelin is SPU's !rst national title in any sport since 2010. A deal's a deal — and by the time she was done, Brittany Aanstad '12 had more than fulfilled her end of the bargain. On a windy Memorial Day Saturday in Pueblo, Colorado, Aanstad threw the javelin 168 feet, 1 inch, to cap her Seattle Pacific University career with the NCAA Division II championship. 6 inches. She earned a share of the SPU Ron Grady Athlete of the Year Award and the GNAC Female Track Athlete of the Year honor. Aanstad and the javelin weren't exactly buddy-buddy. inches to claim the crown. She won the event again as a senior in 2007 with a toss of 139 feet, 11 inches. head coach Jeff Page, who still has that contract in a folder in his office. At SPU, Aanstad picked up with the Falcons right where she left off at Lake Stevens. Aanstad injured her elbow. She had qualified for nationals and had every intention of competing. But the meet doctor and Falcon head coach Karl Lerum ultimately said no. “It was definitely a hard thing to deal with,” Aanstad says. She wound up having elbow surgery. made it all the way to the top.